Currently Gallenberg PC, a Los Angeles County employee class action lawyer is investigating the employment class actions and companies listed below. * If you are interested in pursuing a collective or class action lawsuit or want to obtain more information about how collective action cases work, we encourage you to call us at (818) 237-5267 (Burbank) or (213) 986-8432 (Los Angeles) or (310) 295-1654 (Beverly Hills) or you can fill out our quick and easy online Case Evaluation Form; this is the fastest way to get your case screened by an attorney. We do not charge prospective clients for a confidential telephone intake or online case review. Overtime Class Action For Automatic Deduction of Lunch Breaks: Is Your Employer Automatically Deducting Lunch Breaks? If your employer is automatically deducting a set amount of time for lunch breaks even though you were unable to take a full 30-minute lunch break, you may be entitled recover pay for money for every missed lunch break, premium meal period penalties, attorney fees, costs, and other penalties under California law Contact us immediately to determine if you have claim. Overtime Class Action For Bank/Mortgage Loan Officers: Bank Loan Officer Not Getting Paid For All Time Worked? Bank Loan Officers may be entitled to overtime pay under California law depending on their job duties. Many times, employers misclassify these types of employees to avoid paying overtime wages. Contact us immediately to determine if you have claim. Overtime Class Action for Security Guards: You A Security Guard and Not Provided Meal Breaks or Rest Breaks On Time? Security jobs tend to lend themselves to the failure by the employer to provide proper meal and rest breaks if at all. If you were or are a security guard, but you are/were not provided meal breaks or rest breaks on time or at all, contact us immediately to determine if you have claim. Overtime Class Action: Manager At A Restaurant Or Retail Store Not Getting Paid Overtime? Overtime Class Action For Financial Advisors: Financial Advisor and Not Getting Paid For All Time At Job? Financial Advisors may be entitled to overtime pay under California law depending on their job duties. Contact us immediately to determine if you have claim. IT Employee Class Action: Have You Worked As An IT Employee? If So, You May Be Entitled to Overtime Pay. Information technology workers sometimes qualify for overtime pay even though they have been classified as salaried employees by their employers. This may amount to thousands of dollars owed to employees who have worked overtime hours for some years and are qualified to get paid for overtime pay, but were not paid overtime pay. A former employee may be able to recover overtime pay even though he/she no longer works with that employer. What matters is whether the employee is entitled to overtime pay and how long ago did that employee stop working for that employer. Even if the employee signed a severance agreement (release/waiver), that employee may be entitled to overtime pay owed. It is important to contact a lawyer as soon as possible to avoid losing a claim due to the passage of time. In California, to determine if an employee is entitled to overtime pay, the courts look at what job duties the employee performed. An employee may be entitled to overtime pay even though the employee is getting paid a high salary. An employee may be entitled to overtime pay even though the employee has been given the job title of “Manager” or another similar title. An employee, who is entitled to overtime pay, is also generally entitled to rest breaks and meal breaks and if those are not provided, then the employee may be entitled to additional wages. For every day an employee waits to file a lawsuit, the employee risks losing a day of overtime pay owed. This is because the law only allows an employee to go back a few years in time, even if overtime pay was owed before then. If you have any information about any employer violating the rights of employees or are interested in pursuing a class action claim, submit the information to a Los Angeles Lawyer; at (213) 986-8432. For Beverly Hills, please call (310) 295-1654. 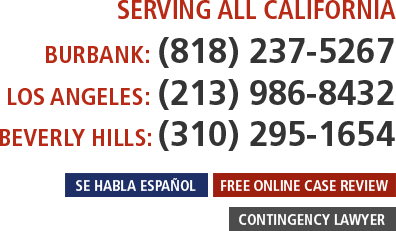 To submit your case for review to a lawyer in Burbank and surrounding San Fernando Valley, please call (818) 237-5267 or you can fill out our quick and easy online Case Evaluation Form; this is the fastest way to get your case screened by an attorney. We do not charge prospective clients for a confidential telephone intake or online case review.